An article points out what we should all be concerned with, but is being ignored - pesticide residues of glyphosate (found in Monsanto's Roundup) and 2,4-D in foods. Glyphosate is the most used pesticide in the world, and both glyphosate and 2,4-D pesticide residues in food are set to really increase with the introduction of genetically modified crops resistant to both pesticides (The farmers can spray the pesticides against weeds repeatedly and the crops won't die - they're resistant to the pesticides, so the crops and foods will contain pesticide residues.). Both pesticides are linked to a variety of health problems. The FDA, under pressure, started analyzing some foods this year for glyphosate residues, but has already stopped due to "problems". When and if they resume is unknown. It is important to know that pesticide residues at varying levels have been found in many foods (here, here, and here). What this chronic low level exposure does to humans is unknown. The only way to avoid or minimize pesticide exposures is to eat organic foods (here, here, and here). Government testing for residues of an herbicide that has been linked to cancer has been put on hold, slowing the Food and Drug Administration’s first-ever endeavor to get a handle on just how much of the controversial chemical is making its way into U.S. foods. 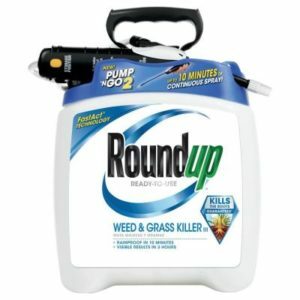 The FDA, the nation’s chief food safety regulator, launched what it calls a “special assignment” earlier this year to analyze certain foods for residues of the weed killer called glyphosate after the agency was criticized by the U.S. Government Accountability Office for failing to include glyphosate in annual testing programs that look for many less-used pesticides. Glyphosate is the most widely used herbicide in the world, and is the key ingredient in Monsanto Co.’s branded Roundup herbicide line. Glyphosate is under particular scrutiny now after the World Health Organization’s cancer experts last year declared the chemical a probable human carcinogen. Several private groups and nonprofits have been doing their own testing, and have been finding glyphosate residues in varying levels in a range of foods, raising consumer concerns about the pesticide’s presence in the American diet. The FDA’s residue testing for glyphosate was combined with a broader herbicides analysis program the FDA set in motion in February of this year. But the glyphosate testing has been particularly challenging for the FDA. The agency was finally forced to put the glyphosate residue testing part of the work plan on hold amid confusion, disagreement and difficulties ....FDA spokeswoman Megan McSeveney confirmed the testing suspension and said the agency is not sure when it will resume.....Alongside the testing for glyphosate, the FDA laboratories have also been analyzing foods for 2,4-D and other “acid herbicides,” documents obtained from the FDA show. The category of acid herbicides includes five of the top 10 active ingredients used in homes and gardens. Usage of 2,4-D is expected to triple in the coming year, according to the FDA. McSeveney said glyphosate residues were only being analyzed in soy, corn, milk and eggs and the popcorn samples, while the other foods are being tested for residues of other herbicides. Earlier this year, one of the agency’s senior chemists also analyzed glyphosate residues in honey and oatmeal and reported his results to the agency. Some honey samples contained residue levels well over the limit allowed in the European Union. The United States has no legal tolerance for glyphosate in honey, though the Environmental Protection Agency (EPA) said recently it may set one because of the FDA findings. With the testing on hold, it is not clear when the agency might have final results on the glyphosate residue analysis. McSeveney said preliminary results showed no violations of legal tolerance levels allowed for glyphosate in the foods tested. She did not provide details on what, if any, levels of residue were found. Tolerance levels are set by the EPA for a variety of pesticides expected to be found in foods. When residue levels are detected above the tolerance levels, enforcement action can be taken against the food producers. Though FDA annually tests domestic and imported foods for residues of other pesticides, it never tested for glyphosate before. It has not routinely tested for 2,4-D either, a fact also criticized by the GAO. The FDA testing for 2,4-D residues comes as the use of 2,4-D with food crops is expected to start rising due to the commercialization of new formulated herbicide products that combine glyphosate and 2,4-D. Safety questions have been raised about the combination. But the EPA gave a green light on Nov. 1 to a Dow AgroSciences’ herbicide combination of glyphosate and 2,4-D. The new products are intended to counter widespread weed resistance to glyphosate, and be used with new types of genetically engineered herbicide-tolerant crops. Previous article:Probiotics Beneficial In Alzheimer’s Disease?